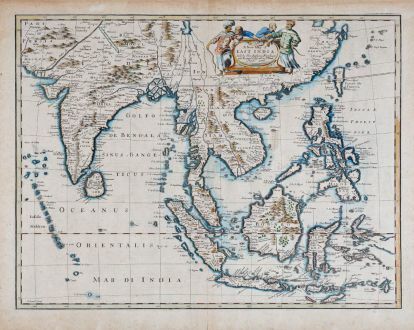 Old coloured map of Southeast Asia. 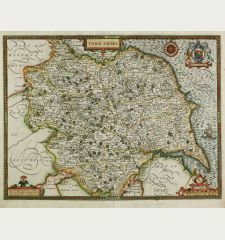 Printed in London by T. Bassett and R. Chiswell in 1676. 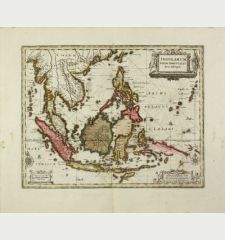 Old coloured antique maps of Southeast Asia and India by John Speed. 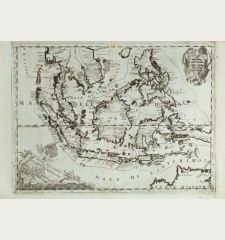 Published in Prospect of the most famous parts of the world, the first World Atlas published by an Englishman. 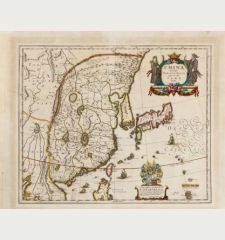 The English text on verso provides a 17th Century description of Southeast Asia. 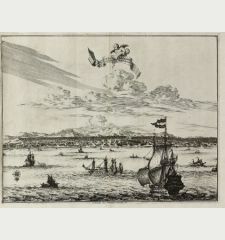 Engraved by Francis Lamp. 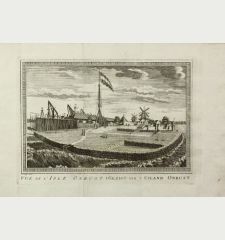 From the last edition of John Speed's Prospect of the most famous parts of the world published by Bassett and Chiswell long after Speed's death. 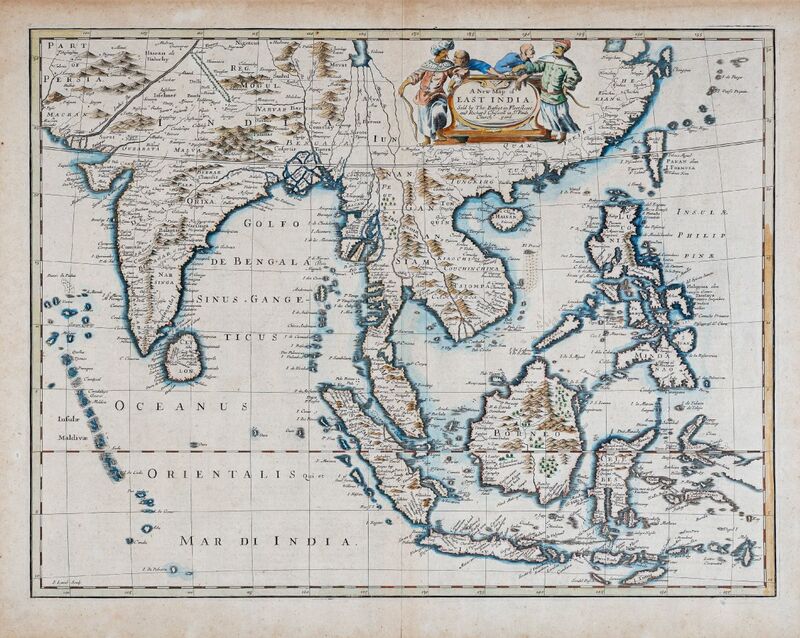 Since this Southeast Asia map only appears in the last edition of 1676, it is considered as rare. Browned in the mangins. 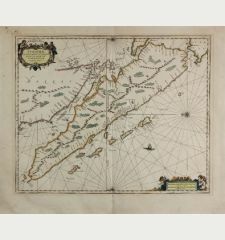 Small part of upper right corner in margin missing. Very good condition with old colours. 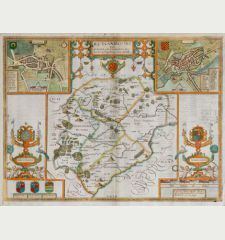 John Speed was born 1552 at Farndon in Cheshire. First followed his father trade as a tailor until the age of fifty. 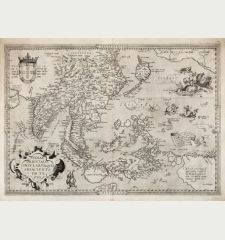 His real profession was from early age map making an historian as an amateur, and he focused on this with the help of Sir Fulke Greville. 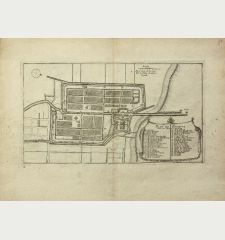 As source for his maps, Speed used material from Saxton and Norden, but he also considered up-to-date material especially for the inset town plans on his maps. 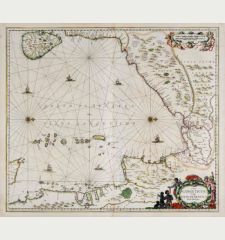 The maps have been engraved by Jodocus Hondius in Amsterdam and shipped back to London for printing. 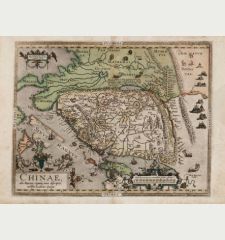 The first edition of his Theatre of the Empire of Great Britain came to sale 1610-11 and was re-issued until 1770. 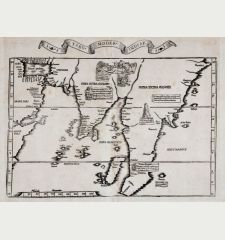 In 1627 he published A Prospect of the Most Famous Parts of the World, the first World Atlas produced by an Englishman. 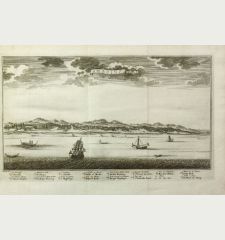 Re-issues have been published until 1676. 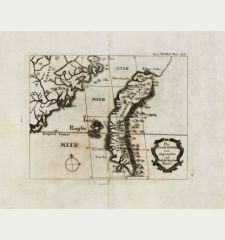 John Speed: A new map of East India.